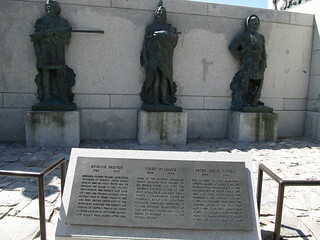 The This Is The Place Monument is a historical monument at the This Is The Place Heritage Park, located on the east side of Salt Lake City, Utah, at the mouth of Emigration Canyon. It is named in honour of Brigham Young's famous statement in 1847 that the Latter-day Saint pioneers should settle in the Salt Lake Valley. Sculpted between 1939 and 1947 by Mahonri M. Young, a grandson of Brigham Young, it stands as a monument to the Mormon pioneers as well as the explorers and settlers of the American West. It was dedicated by LDS Church President George Albert Smith on 24 July 1947, the hundredth anniversary of the pioneers entering the Salt Lake Valley. It replaced a much smaller monument located nearby.